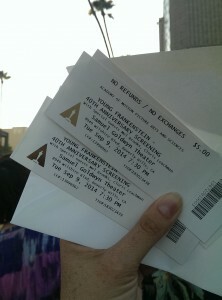 This past Tuesday night I got to attend a screening of YOUNG FRANKENSTEIN at the Academy in Beverly Hills. The theater was packed and sold out! The Q&A was full of laughs and memories for all to share in. Mel and Cloris had more than a few back and forth jabs at each other. Everyone was very quick witted for sure. Cloris complained that Mel didn’t stop Gene when he would continue to laugh and ruin takes. The scene walking along the stairs when they first arrive at the castle took like 15 takes. Mel says he couldn’t yell at his star. Terri admitted her mother worked on the film on the costumes and Mel never knew that they were related. Everyone shared their favorite scenes on down the line. Mel said how the first cut was over 2 hours and after his test screening he cut it down to 91 minutes and delivered the film we all know and love and laugh along with. One of the most enjoyable moments was when Cloris picked out her grand-daughter who was in the audience and explained to her the “knockers” joke. Cloris stood up, and made it clear that “knockers” had two meanings. It had been a while since I last saw YOUNG FRANKENSTEIN. It was a lot of fun and the theater was full of laughter. No matter how many times I’ve seen it the jokes get me every time. Oh, Mel and Cloris stuck around to watch too. I could peek over and see Mel chuckling along, and his son Max Brooks was there too. Previous Previous post: GROOT, I AM GROOT!